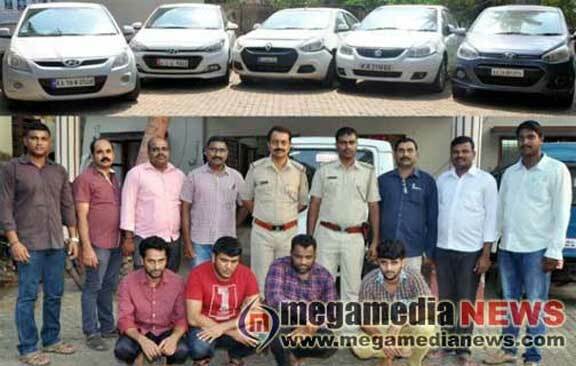 Mulki: 4 notorious car thieves who are wanted in several cases registered at Panambur, Surathkal and Ullal police station limits were nabbed in a joint operation conducted by Mulki police along with Mangaluru CCB police. 5 cars worth Rs. 50lacs have been recovered from the arrested. Mulki police along with Mangaluru CCB police were conducting vehicle inspection at Bappanadu check post. The police got suspicious of a car driven by Fayaz and stopped him for questioning. He was driving a car that was reported stolen on the first week of this month at Ullal police station limits. After he gave information of the theft, he was immediately arrested for further questioning. The police further arrested 3 persons who were residing within Surathkal police station limits at Mukka. The three arrested have been identified as Rohan Sailesh D’Souza from Ullal, David Clinton from Bantwal and Eesa Roshan from Valencia in Mangaluru. Fayaz was wanted in many cases and is an associate of Kukkaje Aboobakkar who is accused in the fake R.C. creation racket. The operation was carried under the leadership of Police Commissioner T.R. Suresh along with the direction of Deputy Commissioner Hanumant Raya and Uma Prakash.